The hospital, medical and health care industry has widely used of the medical trolleys. These trolleys come in different types to choose from. They either just have two shelves or else are fitted with stainless steel waste bin. Some are fitted with a single door cabinet or even with a double door cabinet. The reason why this medical cart is used a lot these days is due to a variety of factors. 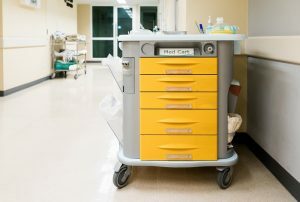 Here are a few reasons why having a medical cart – anaesthetic trolley is useful when you are getting them in your hospital or a medical. The trolleys which are made up of steel, last for a really long time. The carts are very strong, and they do not tend to rust like the trolleys made up of iron. If these trolleys are made up of wood, and in case they are subjected to spills, water and liquid which are dropped regularly on it, there are chances of it rotting and not lasting very long. Hence, a medical cart which is made up of steel or a good material is always a good thing to have. The highly mobile work-flow of the caregivers asks for flexibility — the ability to move things from one room to another and carry things. You can follow the doctors if they want to have the medical cart – anaesthetic trolley with them. You can have a single cart which can move around different rooms in the hospital. Space is really a problem in many of the old hospitals. Thus, having a cart is very useful as there can be a trolley which can move around easily and it won’t take too much space. When the stainless steel medical carts are made, they are finished with an electropolishing. This not only increases the shine and the brightness, but also the sterility quotient of the medical cart. The wooden carts, on the other hand, are a good breeding ground for bugs, insects and other creatures which tend to make the cart worse. This compromises the cleanliness and sterility of the cart. Also, in case of spillages, these tend to attract a lot of fungi and rot as well. These medical carts are made in different styles, sizes and also in different shapes. They can be made according to the requirements of the hospital, medical or health care unit and can also have two or more shelves. The shelves can be fitted on the cart which is very strong. These carts can have two or four wheels which are fitted at the end of the legs. Some of the carts are also fitted with brakes for extra security and safety. If the hospital has some unique requirement, then even they can be added. These trolleys are very easy to assemble, and moreover, they do not require any special training for the assembly. Even if you are doing it for the first time, you can do it properly and swiftly. They can also be folded and hence accommodate even in the smallest spaces. The carts provide a hygienic and sterilized environment. These have to be maintained to keep them away from bugs in order to keep them insect-free. The medical cart – anaesthetic trolley is equipment which can save you a lot of time. It can be used to integrate health care along with adding technology to the patient’s bedside. All the reports and medications can be found at the bedside. This saves a lot of time searching for things. Before one goes ahead and chooses a medical trolley, these are a few considerations to be kept in mind.